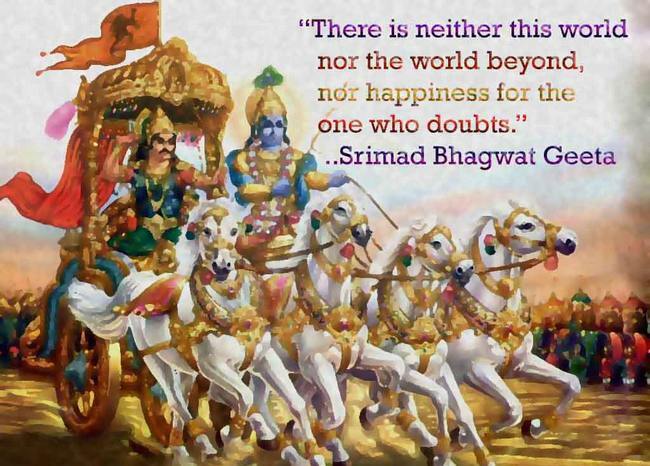 The Bhagavad Gita (literal meaning ‘the songs of the Lord‘) is one of the celebrated sacred works of Hindus. Considered as an important piece of Smrti literature, the Gita is narrated by Sanjay to the blind king Dhritarashtra and it contains seven hundred verses spread over eighteen chapters or discoverers. The word ‘ethics’ comes from the Greek word ‘ethikos’. It refers to one’s moral character and the way in which society expects people to behave in accordance with accepted principles. Most philosophers conclude that ethical failure occurs because of lack of character. In Bhagavad Gita, Krishna imparts to Arjuna wisdom, the path to devotion, and the doctrine of selfless action. Krishna tells Arjuna not only how to build character but also the root cause of ethical failure and how to avoid it. Bhagavad Gita is one of the earliest texts in any tradition to emphasize that it is important not just to do one’s duty, but to do it in a certain kind of way; i.e., with detachment. The principle of world-welfare provides the basis for assessing the nature of an administrator’s duty in a changing world, even when faced with competing duties as in the case of moral dilemmas. Gita’s virtue theory also emphasizes virtues that are indispensable for righteous administration. Virtues such as an unagitated mind (anuvignamanās), firm mindedness (prajñā pratiṣṭhitā), disinterestedness (anapekṣas, udāsīnas), contentment with one’s own duty (svakramaniratas), indifference to pleasure and pain (samaduḥkhasusukhas) ,being the same towards friend and enemy (samaḥ śatrāu ca mitre ca) and towards honour and disgrace (mānāpamānayos) allow an administrator to perform his/her duty in most ethical manner. Through the concept of dharma, Gita also identifies the essential ideas and governing principles of our cultural life and through karma yoga & jñāna yoga, also identifies course of action for man’s search for eternal which is the source of truth and joy. The Bhagavad-Gita advocates a consciousness and a spirit-centered approach to the subject of ethics based on eternal values and moral principles that should govern the conduct of administrators. The teachings, Krishna outlined to Arjuna form a system of ethics that has withstood the test of time. Krishna outlines 26 qualities of a gentleman – to be merciful, obedient, truthful, equitable, saintly, magnanimous, mild-mannered, clean, simple, charitable and peaceful. He should have surrendered to God and not be greedy or possessive but remain steady and determined, free of the six bad qualities, not gluttonous, sober, respectful, humble, grave, compassionate, friendly, eloquent, expert and concise. In Gita, Krishna also outlines how to cultivate and maintain these qualities. He says to maintain good character, we must overcome kama, that is, lust or selfish desire. Kama means not just sexual craving, but it simply refers to an overwhelming desire for anything, such as lust for power. Greed, dishonesty and corruption are all byproducts of lust. To build character one must control lust. When Arjun got depressed by the sight of the warriors who were all his friends, teachers, relatives and refused to fight. Krishna using the concept of body and soul justifies the war and even killing of own people through art of discharging duties. He asks Arjun to discharge his bounden duty without any regard for pain or pleasure which arises from it. Similarly in administration, it is important that officers occupying position discharge their duty without any consideration of personal affection. Hence one should rise above the pretty material interests and act with an unprejudiced mind devoid of all attachments. According to Bhagavad Gita the highest form of Swajdharma (one’s faith), concerned with a self-less duty towards the rest. Bhagavad Gita desires an administrator to be a combination of a raja and a rishi i.e. synthesis of selflessness and saintliness. He should not only discharge duties without considering feeling of personal affection such as friend or relative but also should behave like a rishi i.e. no consideration for personal gain. When one combines power and social responsibility with the strength arising from character, clear thinking, dedication, and practical efficiency, one effects in oneself this unique synthesis of the rajashri. In the opening three verses of the Bhagavad Gita (4.1-3), lord Krishna also highlights Yoga as means to attain this stature of Rajashri. Here Krishna advises Arjuna to detach from being concerned with whether or not the duty bound action is successful or what rewards he will get, instead he should prepare himself to perform the action to the best of his ability. In contemporary times an administrator has to orients oneself toward realization of task by acting in accordance with one’s duty (dharma) without consideration of personal self-centered desires, likes or dislikes. One needs to act without being attached to the fruits of one’s deeds. Sva-dharma means literally “own dharma” and has been translated as “own duty” and “particular responsibilities.” Sva-dharma is unique to that person because everyone has different capacities for righteousness. Loka-samgraha, which could etymologically be analyzed as ‘holding’ (from grah, to grasp) ‘together’ (sam) ‘the world’ (loka), include selfishness action done for public good. According to Bhagavad Gita, the highest form of Sva-dharma (one’s faith) is performing self-less duty towards the rest or Lokasamgraha. The message of Bhagavad Gita is that either you can perform your actions with attachment thinking that you are the doer or you can perform the same without attachment by thinking that God/ Nature(Prakriti) is performing the actions. This unattached performance of actions has been called Yagya or Karma Yog in the Gita, which will not only fulfill all desires but will also transform us and make us one with God.